The smartest entrepreneurs plan on growing and are prepared for change. I have a few words of advice for first-time entrepreneurs, as well as seasoned business owners looking to hit a new stage of growth. My advice is this; write your business plan in pencil. I realize this may be difficult for all you non-golfers, but doing so will illustrate two important principles. I have little doubt that you (the small-business owner) will shortly have to change, amend, modify, scrap or abandon your original business plan altogether. One of the attributes of successful entrepreneurs is flexibility. By writing your business plan in pencil it forces you to look at change as the only constant. Make change your friend, embrace it and work it to your benefit. The reasons why your original plan will need to be changed after your company is operational are myriad. It's likely you under or over-estimated your competition, margins, cash needs, competencies and suppliers. Or you misjudged market need and size. Every entrepreneur discovers new opportunities that didn't appear until there was actually a business up and running. We must avoid business plan worship. When we see documents neatly typed (and maybe even received praise for them), we are reluctant to change. Especially for those who attended business schools where the plan took on a larger than life importance. People whose plans got high marks, or even worse, won a business plan contest, tend to feel their plan is inviolate. They also tend to believe that if they rigorously adhere to the plan it will yield the riches of their dreams. 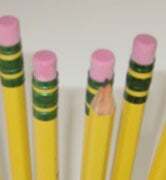 It's my hope that the mental image of a pencil will remind you that change is good and will help you reach your goals. Most small-business owners that I know never wrote a business plan. In 16 start-ups, I've never written one. And John Altman, a very successful entrepreneur, founder of six companies and former professor of entrepreneurism, never wrote a business plan for his start-ups, either. Most people who write a business plan do it to raise money or because someone told them that's what they're supposed to do. The fact is that a detailed plan is only required if you want to raise money from a bank or venture capitalist. And both hardly ever offer a loan or invest in early stage companies. So your energies are wasted writing those long and thick plans. Now don't get me wrong. I strongly believe in planning, just not in long, voluminous tomes that will probably go unread. For most sole proprietors, that business plan can reside in your head, or--if you must commit it to paper--on a napkin. If you really want to write a plan, try this. At the start of each year write what your goals are and specifically target new areas of distribution and the names of new accounts that you want to clinch. Also, put on paper the names of current customers with whom you want a deeper relationship and the strategies you'll employ to do so. This plan should only run one or two pages. I also recommend you write down your accomplishments and shortcomings from the previous year. While you can do this exercise primarily for yourself, I would also share it with members of my team. As your company gets bigger, that's when those written planning documents become paramount. As your company grows you want to be sure all your employees are on the same page and equipped with the knowledge of how they can contribute to the company goals. It is a reversal of commonly accepted logic to suggest you postpone the business plan until you've reached a growth spurt. But, as John Altman said on this point, "If you're going to empower the other people in your company, guess what; you'd better give them a map to the highway you're on! Otherwise, they can't share that vision in your brain."